As part of the Ute Mountain Ute Tribe’s commitment to protect and promote the development of prosperous and resilient tribal communities, the Bureau of Indian Affairs (BIA) received funding to support and implement an Open Space and Housing Master Plan. The Master Plan builds off of the Tiwahe Initiative, a coordinated service delivery model that selected 4 tribal communities an opportunity to create a social services plan centered on the needs of the family and community. Tiwahe means “family” in the Lakota language and symbolizes the interconnectedness of all living things and one’s personal responsibility to honor family, community and the environment. The Tiwahe Inititative established a series of visioning, strategic planning, and action planning initiatives in an effort to design a holistic, community based, coordinated system of care to protect children, youth and families. 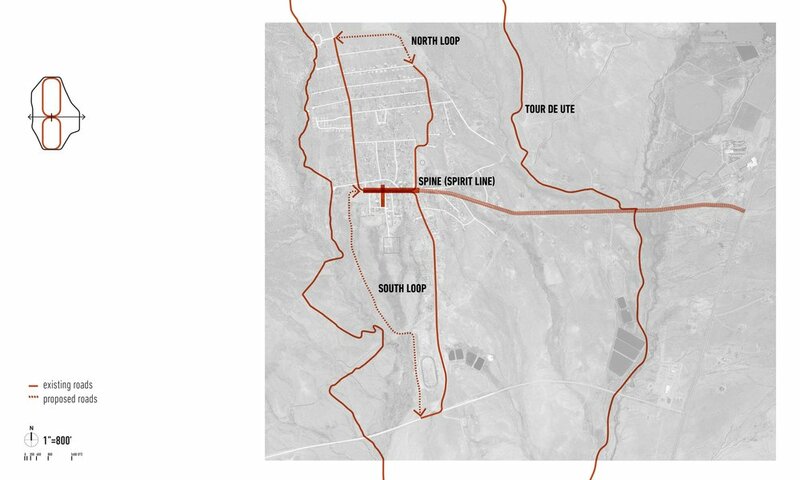 The Open Space and Housing Master Plan builds upon the vision of the Tiwahe Initiative, integrates traditional ways if living on and moving through the landscape, and responds to the Ute’s overwhelming need for wellness and hope. COMMUNITY WORKSHOP MAPPING Using large scale printed maps, colored tapes, safety pins and beads to work with the community to document their community. The workshop documented peoples favorite spots, how they move through the community, unsafe areas and locations where they see opportunities for new development. The Master Plan will develop strategies for trails, parks, stormwater management, native plant restoration, pedestrian-oriented infrastructure (sidewalks, crosswalks, lighting, and planting), economic development opportunities, social and recreational amentities, and housing typologies and layouts. The design team has held three interactive workshops with different groups within the tribe including, youth, elders, and veterans.